On September 17, you claimed in your blog that Arianna Huffington and HuffPost are something other than malicious, flame-throwing, pathologically-deceptive radical leftists. As this letter will demonstrate, you are severely mistaken. The "series" turned out, it seemed to me, to be a big public relations win for Armey as mostly a platform for his views, while Huffington's main point was that "the solutions are beyond left and right" and spent as much or more time bashing the Obama administration, aside from noting that the problems grew from "obviously a failure of the Bush years." My Points: One is that Huffington may be labeled as "a liberal Democrat," but she and her widely viewed website strike me, as a reader, as an equal-opportunity critic. Armey is not. There are plenty of sharp, critical assessments of the Democratic Party and administration on her site. Doesn't it matter that [Huffington and others are] banging away that Obama isn't socialist enough? But apparently, in the upside-down world of "public" broadcasting, anyone that deviates from the "more-government-is-better" viewpoint is classified as a right-wing extremist --- while a fire-breathing leftist demagogue like Ms. Huffington is depicted as nonpartisan. 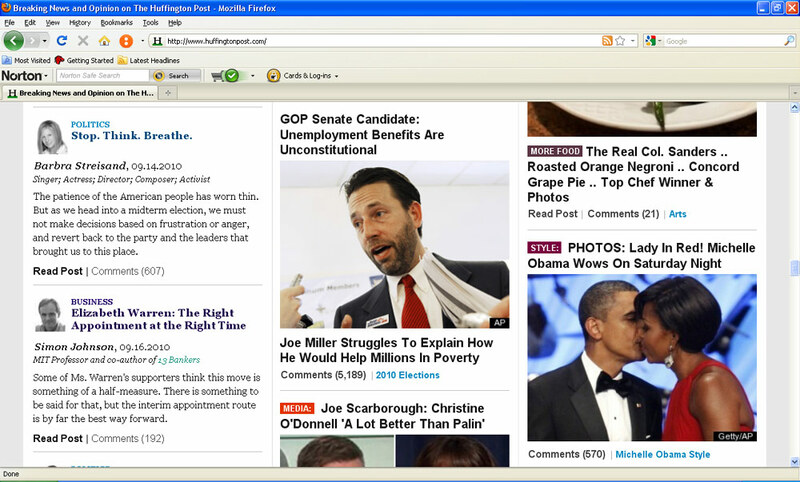 For starters, take a look at these screencaps, taken of HuffPost's front page at the same time on Sept. 19, 2010. Do you know of any other "news" publication that would publish two items of Obama-worshipping schlock like these on its front page, at the same time? Sandwiched against "news" stories that, just coincidentally, are critical of conservatives? HuffPost's Obama-worship goes all the way back to 2007, Mr. Getler. Consider that after HuffPost denied numerous accounts of how it was shilling for the Obama campaign, and relentlessly attacking his opponents, it wasn't until November 21, 2008 --- several weeks after the presidential election --- that Ms. Huffington decided to finally inform us that there are only three people in the world that she text-messages: her two daughters and... Barack Obama. 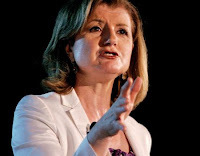 6/2/10: HuffPost's total blackout of "the rest of the story" regarding the "Peace Flotilla"
Does any journalist have the courage to ask Arianna Huffington these three questions? 7/17/10: Beyond chutzpah: Arianna Huffington objects to PolitiFact claiming she tells "half-truths"
Would it not be a good idea for you to request that, in a future PBS interview with Ms. Huffington, she be asked how she can make these and similar public claims --- when the facts show that HuffPost, under her editorial leadership, violates these principles as a matter of policy? Hopefully, all this information will help enable you help PBS to present its viewers with a more accurate and candid portrayal of the woman whose "newspaper" you describe as nonpartisan, or centrist. Related: Mission and Approach of PBS Ombudsman, and PBS's Editorial Standards. Also, if you'd like to make your voice known to HuffPost's senior management (politely, please), here.